An unsightly and heavily eroded storm channel at Morehead State University recently got a much-needed upgrade that transformed the eyesore into a beautiful part of campus. The area was "completely hemmed in" by an adjacent roadway, a new ropes course, a parking lot, and a pedestrian bridge. "We really couldn't afford to use a product that required a lot of geogrid," explained designer Chris Howard, RLA and Principal at CARMAN. CARMAN was already working on a new recreation center nearby when they were called on to create plans to improve this drainage area. "It's been an eyesore for quite some time and everything had been built up around it," Howard explained. "There was a lot of erosion and Morehead wanted to pipe a portion of the creek and to do a stream bank restoration on the rest." Because it can be installed in tight construction spaces, Redi-Rock was an ideal solution for this storm channel beautification and reinforcement project. Since a roadway is located directly adjacent to the creek, restoring the creek's channel required a retaining wall solution that didn't require a lot of geogrid. "We couldn't afford the space to fit that all in," Howard said. These constraints reminded Howard of a project that required a similar retaining wall solution in his own home neighborhood. 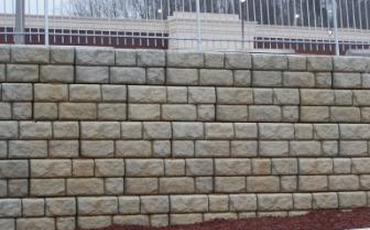 There, a road widening project required extensive retaining walls that could be built without encroaching on residents' properties and Redi-Rock gravity walls in the Ledgestone texture were the perfect solution. "It really looked nice for a modular system and we thought it would work well here at Morehead." Gravity Design: Redi-Rock gravity walls harness the power of gravity with 1-ton blocks that stack up like giant Legos blocks, requiring no geogrid reinforcement in many applications. This allows walls to be installed closer to existing infrastructure or property lines - a major benefit in tight areas like this. "There was no room for geogrid and no room for over-excavation, so the product worked very nicely in this scenario," Howard said. Engineered Strength: Although this stream bed is often dry, high flow is a fairly common occurrence and the channel needed a product that could handle it. High water flow is no problem for Redi-Rock because the one-ton blocks are manufactured using 4,000PSI (27.6 MPa) architectural-grade precast concrete. In addition, "we installed rip rap to protect the footings from the scouring effects of the flow," Howard said. Efficient Installation: Each one-ton Redi-Rock block stacks up like a giant Lego block using a small crew and heavy machinery. The shape of each Redi-Rock block allows construction of inside and outside curves as well as inside and outside corners without cutting blocks. Installers dealt with the challenge of poor soil conditions by over excavating to reach bedrock for the footer of the walls. "Bedrock was so close that it just made sense to excavate down for most of the length of the walls," Howard explained. The installation team was also challenged with tight working conditions. "There was very little room to work on the surface," said Martin Fister of Free Contracting. "Installing this project was challenging because we had to maintain the flow of the creek and it was installed during the rainy season. Overall though, it turned out to be a good looking project." Superior Aesthetics: The natural stone texture and color of the Redi-Rock Ledgestone blocks "blend in well with the adjacent buildings," Howard said. With Redi-Rock, a variety of standard wall textures and colors are available, including Cobblestone, Limestone, Ledgestone, and Kingstone. These blocks are cast in molds taken from real stone, giving them a depth of texture of up to 5 inches. When completed, the walls for the project totaled 3,000 square feet (278.9 square meters). At the tallest point, the walls stood 9 feet (2.7 meters) above grade and were topped with Redi-Rock cap blocks and coordinating fencing. What was once an eyesore is now a beautiful part of campus. Redi-Rock Ledgestone retaining walls helped turn this eroding eyesore into a beautiful, structurally sound storm channel at Morehead State University.